Just 90 miles north of the city is Outlier Inn, a 12-acre Catskills farm complete with a recording studio, greenhouse with seasonal produce for sale, pond, and plenty of furry friends (sheep, goats, alpaca, bunnies). 6sqft previously featured some of the funky properties up for rent here this summer– a geodesic dome, 127-square-foot tiny house, and a 1930s farmhouse with its own yoga studio. 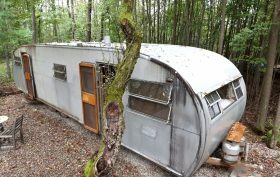 The latest offering on the scenic property is this 1953 Spartenette Trailer, which remarkably can sleep four people. In addition to its space age-like metal shape, this vehicle has all the retro touches you’d expect, from teal leather banquets to vintage appliances, and it’s available for $125 night on Airbnb.